15th March 2018: Advantis Medical Imaging announces that it received the CE Mark approval from BSI Group for Brainance® MD, its Cloud-Based Neuroimaging software. This market approval allows Brainance® MD to be used as part of the clinical workflow for the advanced processing of Brain MR images. “Speaking on behalf of the entire team of Advantis, we feel really excited to make this announcement. This is a significant milestone for our company and the fact that Brainance® MD can now be integrated in the clinical processing workflow fulfils one of Advantis principal goals: to make state-of-the-art processing methodologies available for every doctor, anywhere, anytime. ” said Zoi Giavri, CEO and co-founder of Advantis Medical Imaging. “This CE Mark approval confirms our capacity for innovation and justifies the entire team’s devotion and effort on striving for increased quality and performance, while bringing added value to the clinical daily practice and helping patients improve their quality of life.” said Paris Ziogkas, COO and co-founder of Advantis Medical Imaging. 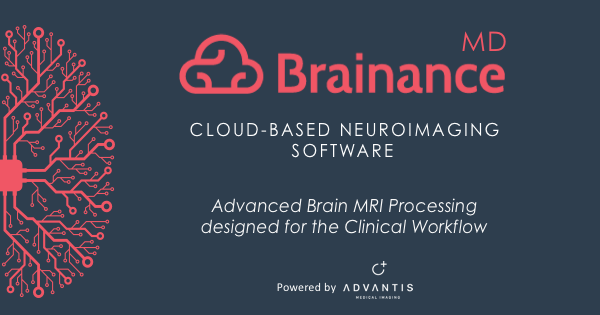 Brainance® MD is a cloud-based software application for the display, processing and analysis of Brain MR Images, which include Diffusion Tensor Imaging, DSC Perfusion and Functional MRI all in a unified user environment, allowing this way Fusion among modalities. Brainance® MD is accessible from a web-browser and can support remote and collaborative analysis. Its reporting and visualisation features can assist healthcare professionals on optimising their daily clinical practice, while working with state-of-the art methodologies in a zero-footprint platform. Brainance® MD is compatible with the DICOM standard and can also be seamlessly interconnected with PACS systems in order to preserve the current workflow of the imaging department. Brainance® MD is provided as a Software As A Service (SaaS) under flexible subscription plans suitable to smaller and larger healthcare organisations, which want to combine high quality of services with increased scalability of their resources according to the current demand. The company will continue making advanced medical image processing more clinically valuable by exploring the integration of deep learning methodologies, both in its current and future software solutions.